Browse: Home / Annexation Option Bill Filibustered – Could Governor Consider for Special Session? Update from Special Session: The Annexation bill passed! Why should you care? With the ability to vote on annexation instead of having it forced upon us, it gives our area important leverage needed to ensure that if we do ever get annexed the process will be a fair one and that adequate services can be negotiated. This removes forced annexation from being a fore-gone conclusion; forced annexation has resulted in a number of law-suites when the the City of Austin has historically annexed land without a perceived fair treatment for existing debt, amenities, etc. Senate Bill 715 and a corresponding House Bill were intended to extend the rights of areas outside cities by allowing qualifying areas to vote before being annexed. If passes, this legislation would have given rights to a number of communities in Austin including Steiner Ranch, Barton Creek, River Place and others. Presently, there are few to no rights or guarantees of service when an area is annexed. 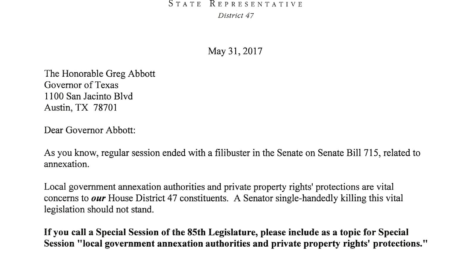 A San Antonio State Senator choose to filibuster this bill in the senate, such that it was not able to be considered by the full body of the Legislature before the end of session. If you would like to add your voice to this request, you can contact Governor Abbott’s officee by phone (512-463-1782) and via his web site (https://gov.texas.gov/contact/).